The regiment was formed in late 1643 from professional soldiers raised in Holland under direct contract to Prince Rupert. The contract was with a Dutch gun-runner, John Van Haesdonck, to provide 'more or less 200 soldiers, such as are experienced and practised'. Most sources agree that the regiment's companies were probably attached to various regiments during the next few months, more than likely with the Bluecoats as the Prince generally kept his own personal regiments together. The Firelocks were probably stationed in the Shrewsbury garrison during 1644, where it was reinforced from various companies of firelocks which arrived from Ireland. This dramatically increased the number of Irish soldiers within the regiment, particularly in the officer contingent. The regiment were present at the storming of Leicester, 30th May 1645. They led the attack on the Horse Fair-Lees main battery with the rest of the Bluecoats under John Russell. Major Bunnington, the commander (previously a Gentleman Pensioner) was shot through the eye and killed at the top of an assault ladder whilst leading the attack. The regiment's black colour flew over the battery once captured - 'they sette the Prince's black colours on the great battery within'. Originally it was thought that hey were then part of the garrison of Leicester as they were not listed as present as a separate unit at Naseby. Alternatively, they were possibly still attached to the main Bluecoat regiment of foot at Naseby, as they were not recorded as being at Leicester when it surrendered. More recently, Stuart Reid makes the conjecture that they were part of the commanded musketeers interspersed with Rupert's Horse on the right flank at Naseby. 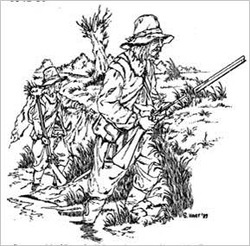 They attacked Okey's men in Sulby Hedges as part of Rupert's charge on the right flank at the beginning of the battle. After fighting them for most of the battle, they escaped through the lanes and hedgerows, one of the few units to escape the battle intact. They went with Rupert to Bristol and escorted him from the gates at the surrender on 11th September 1645 - 'his Life-Guard of Firelocks came forth, al in red coats before him' - they then marched to Oxford, formed part of the garrison there and then disbanded on the 25th April 1645 with the rest of Rupert's regiments. The 'Firelock' is actually the name given to the matchless muskets used in the 17th Century through until the percussion muskets of the Crimean War. In England during the civil wars they were often called 'the snaphaunce'; various designs of matchless ignition were used, including 'dog-lock', 'English lock' and 'French lock'. Whatever the name, the locks worked by the striking of a flint against a piece of steel to produce a spark, which ignited the priming and this the charge. 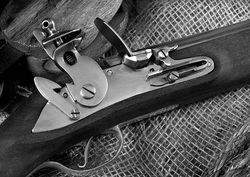 The main advantages over the matchlock were variously given as speed of firing, safety around powder and secrecy at night. The claim that they fired better in the wet has been overturned many times by anyone who has used one on a wet day; the fact that there is no match burning down and needing replacing is obvious. From this, the name of the troops using the matchless guns became 'Firelocks'. There are recorded instances of Firelocks using grenades (called grenadoes) as part of their assault role; the use of Rupert's Firelocks to lead the assault on Leicester shows you how vital their role was. Additionally, Dutch protocol was to issue cartridge boxes with Firelocks, and belts of bandoliers with matchlocks. As the regiment was initially recruited in Holland, there is good evidence to suggest that many of Rupert's Firelocks would have used cartridge boxes or bags instead of the bandolier.